Synopsis: Meet the great Skulduggery Pleasant: wise-cracking detective, powerful magician, master of dirty tricks and burglary (in the name of the greater good, of course).Oh yeah. And dead.Then there's his sidekick, Stephanie. She's… well, she's a twelve-year-old girl. With a pair like this on the case, evil had better watch out…“So you won't keep anything from me again?" He put his hand to his chest. "Cross my heart and hope to die." "Okay then. Though you don't actually have a heart," she said. "I know." "And technically, you've already died." "I know that too." "Just so we're clear. "Stephanie's uncle Gordon is a writer of horror fiction. But when he dies and leaves her his estate, Stephanie learns that while he may have written horror, it certainly wasn't fiction.Pursued by evil forces intent on recovering a mysterious key, Stephanie finds help from an unusual source – the wisecracking skeleton of a dead wizard.When all hell breaks loose, it's lucky for Skulduggery that he's already dead. Though he's about to discover that being a skeleton doesn't stop you from being tortured, if the torturer is determined enough. And if there's anything Skulduggery hates, it's torture… Will evil win the day? Will Stephanie and Skulduggery stop bickering long enough to stop it? One thing's for sure: evil won't know what's hit it. You might think that being dead and alive is impossible. Well, not for our mischievous Mr. Skulduggery Pleasant, it isn’t. This detective is one un-killable man- because he’s already dead. Oh yes, meet the world’s first living skeleton. He’s also a powerful magician, just incase you thought that a living, talking, walking skeleton wasn’t enough. Skulduggery Pleasant is one of those books I’ve wanted to read in a long time, but have never got quite round to actually turning the pages. I expected it to be funny, but I never realised it was this funny. The whole book is littered with humour- mainly from wise-cracking Skulduggery. The humour makes it a very fun read, unputdownable and exciting. Derek Landy has created a fantastic titular character-Skulduggery. With his wittiness and ego, Skulduggery is the jewel if the book, a character whom many authors, I suspect, are envious of. Stephanie and the rest of the cast are pretty standard, Serpine, the villain not being a particularly unique villain. In general, the other characters-Stephanie, Tanith, Ghastly…- could have done with a bit of work in the personality department, but Skulduggery’s character alone is more than enough to fuel the whole book. The Magic system Landy has created is an interesting one. While it isn’t (yet) developed a lot, it still has structure, history and culture. I hope Landy does develop the magic-world in future books, as it is interesting and a good base from which to work on. My only big worry comes with the story; the climaxes just don’t seem epic or intense enough. For example, the first culmination of the book seems over in a chapter, and it seems all too easy for the characters. The second and final culmination, too, suffers from a lack of intensity, and while how it happens is good, how it’s written isn’t so good. In fact, a few times throughout the book, it seems all to easy. Something, again, I hope improves with later books. Landy’s writing style is quite a different matter, though. Easy to read, witty and amusing, it couldn’t be better suited to the book. His dialogues are particularly humorous, full of dry humour, sarcasm and one-liners. 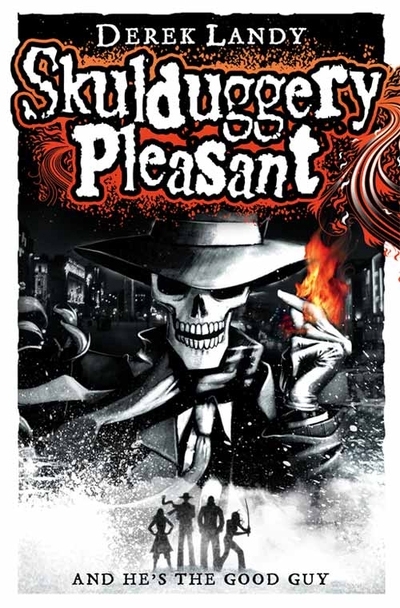 All those (mainly) small criticisms being said, books are meant to entertain, and entertain Skulduggery Pleasant certainly does; so in that respect, this is a great book that is already popular with a great many people. A fantastic start to what looks like a fantastic series, fast paced, extremely funny and with an intriguing setting. A thrilling debut novel. 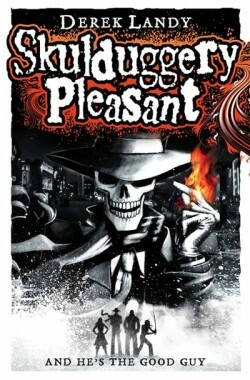 What did you think about Skulduggery Pleasant?